This was an awesome post and so appropos for today, Lisa! I had no idea that was on our campus! Who did you go with anyway? I'm sorry...I'm not sure who you are. Send me a message and I'll let you know. How beautiful. I'm so thankful to have run across your blog today, so I could read this. Thank you! Glad you were blessed! This is a great story! 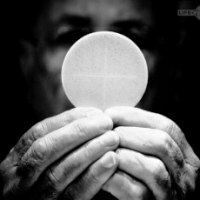 It's sad that many people don't believe in the True Presence of Jesus in the Eucharist these days. really beautiful post...and blog! Thanks for sharing. Lisa, I am truly moved and inspired by your story. Thank you for sharing it. I feel like it's no mistake that I found you and asked you to read my reflections booklet for Eucharistic Adoration. I know the Lord's hand is in this. I look forward to working with you and following your blog too!